Save $100 on the the Ruud XR90! This holiday season, we want to spoil you a little. Remember when you considered replacing your hot water heater, but balked at the cost? With so many other concerns swirling around the mind of a homeowner, purchasing and installing a new water heater often drops to the bottom of the barrel (pun intended). However, if you have noticed rusty or foul smelling water, heard popping sounds or high-pitched whining, or experienced water leaks, it may be time to buck up and replace the darn thing. That’s where we come in. We know winter is the least opportune time to replace anything in your home. It’s also the time when, if you didn’t prepare properly (so few of us really do), plumbing crises tend to happen. To help prevent any major issues, we are offering a special deal on the Ruud XR90, your compact, high-performing, energy-efficient hot water heater, now available to you for $100 off. 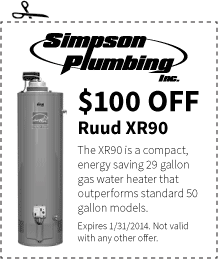 This offer begins now and ends on January 31, 2014, giving you plenty of time to work the purchase of a healthy water heater into your New Year’s Resolutions. Standing at 17 ¾ inch diameter, this hot water heater can be installed by one person and features an integrated self-diagnostic control system that is easy to install and use. Its eco-friendly burner uses a NOx design and meets 40 ng/j NOx requirements, benefitting the environment and saving you on energy costs.. Concerned about maintenance and repair? The Ruud features a Guardian System™ and Sensor with an air/ fuel shut-off device and no filter, so cleaning is removed from the equation. The protective control system disables the heater when in the presence of flammable vapor, reducing your risk of a home fire. Don’t get us wrong. We hope you won’t have to replace another water heater for many, many years, which is why the Rudd features a patented magnesium anode rod design that utilizes a resistor to protect the tank from rust. In addition, just in case you live at a higher elevation, never fear! This water heater is certificed for applications up to 7,700 feet above sea level. That’s what we’re talking about! Outdated water heaters can last for awhile, but not as long as you might think. Water heaters that are long past their prime can spring leaks at any time, causing major flooding in your basement or closet and potentially destroying any carpeting or possessions in the area (remember, water heaters hold fluid in the amount of gallons, not cups. Also, if your water heater is full of rust, the water you drink, cook with, and bathe in could be contaminated with toxic minerals. Is waiting a year or two more to replace your tank worth health concerns and potential property damage? All of us at Simpson Plumbing wish you a very happy holiday season! For any and all plumbing issues, please don’t hesitate to call us, day or night!